"What on earth did I pick this walk for?" I thought to myself, as the sun beat down on us and we dragged ourselves up the steep path to the summit of Ben A'an. We decided to celebrate our anniversary by tackling our first Scottish peak. 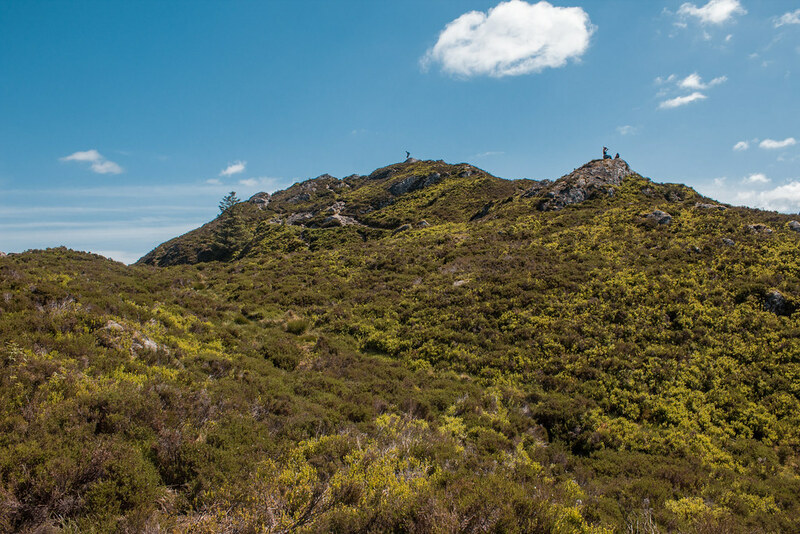 The weather looked good (slightly cloudy, around 16C - ideal for hillwalking) and we picked Ben A'an (pronounced 'ann', I'm told) because I'd seen it described as a 'mountain in miniature' somewhere on the Visit Scotland website, and had seen beautiful views over Loch Katrine on Instagram. We packed our lunch, took a very quick glance at the Walk Highlands guide and enjoyed the hour and a half drive to the starting point. 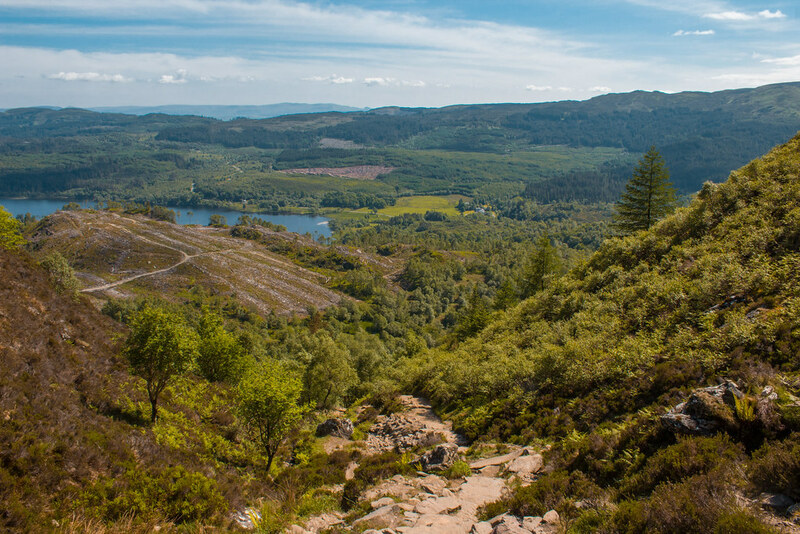 The trail begins at the Ben A'an car park; it's owned by the Forestry Commision and costs £3 per day to park (coins only, no card reader). It's not a huge car park, so if you're planning to tackle Ben A'an on a weekend, I would get there early. We went on a weekday and arrived about 1 pm and it was almost full then. Though the trail isn't signposted (we saw a small sign a couple of hundred metres into the trail), it's easy to follow; you would struggle to get lost to be honest. Put it this way, if I have no problem following the trail, you'll be absolutely fine. 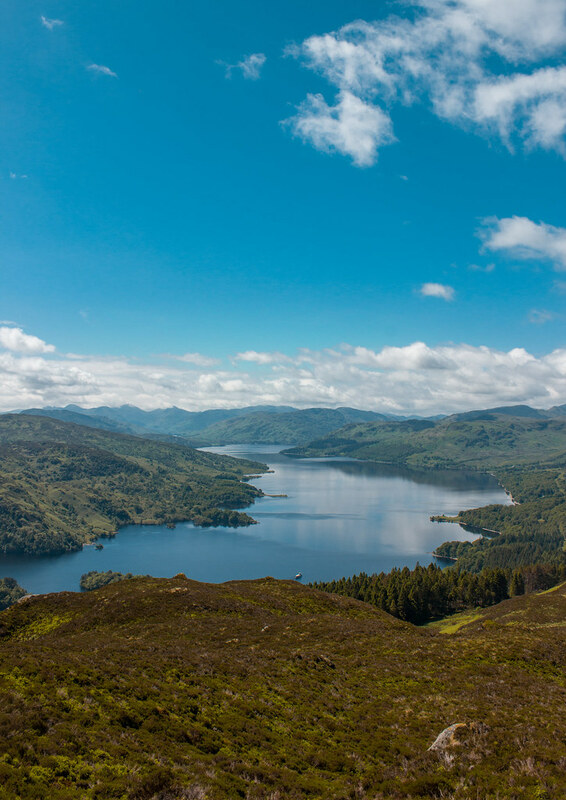 Within a few hundred metres, you're rewarded with stunning views over Loch Achray and the surrounding area. The trail starts off quite steep and remains pretty steep for the majority of the hike. There are a couple of flat-ish bits, but for the most part, you're giving your calves and knees a good workout on the way up. After about 20 - 30 minutes, you'll come across a bit of a crossroads but keep going straight ahead. It's pretty obvious that you don't need to turn off, because if you look left you'll see the path has quite a big gate. Not 100% sure what it is, but it kinda looks like forestry access. As you get closer to the top, it looks like the summit is a huge lump of rock and you might wonder how you're supposed to get to the peak. Fear not. 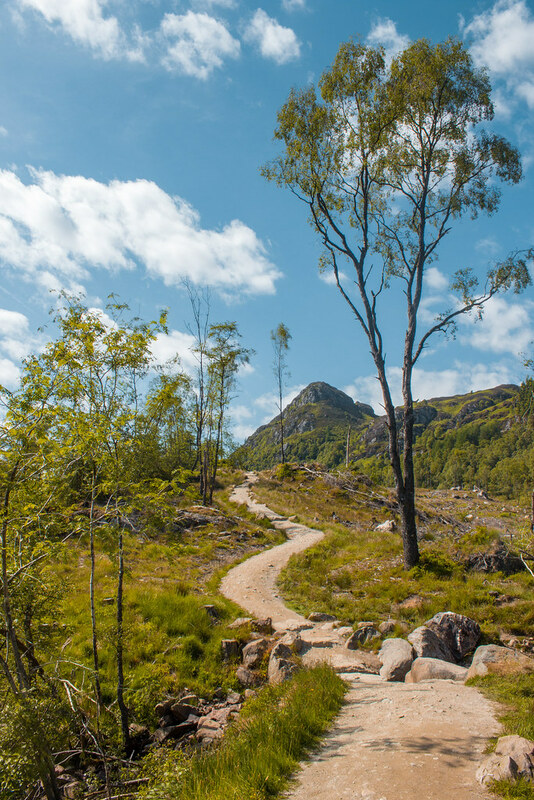 The rocky path leads you around the back and to some absolutely stunning views over Loch Katrine, Loch Achray and the Trossachs. We sat down on a rock, overlooking Loch Katrine, feeling a slight breeze on our faces and questioned whether or not the view was even real. Obviously, we knew it was; it seemed so vast and on such a beautiful day it was hard to believe it was real. It definitely made the steep slog worth it. To be honest, had we researched the walk a bit more and realised how steep Ben A'an is, we probably wouldn't have done it. I'm not going to lie to you, we aren't super fit. We get out quite a bit, but the majority of our hikes are pretty easy. I guess this is a lesson in forcing yourself to do things you think you can't do and pushing yourself. 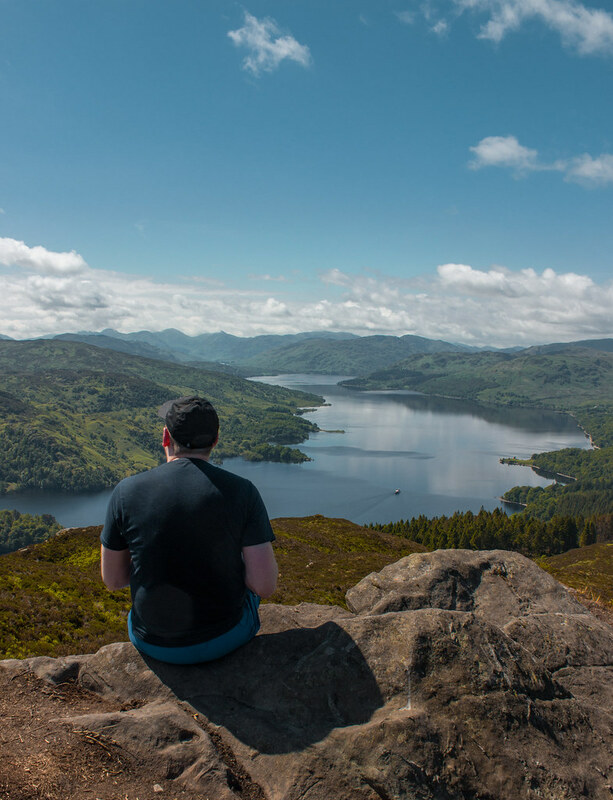 There are a few different spots to sit, perch, enjoy lunch, rehydrate, and take in the view at the top of Ben A'an. Our favourite was not quite the summit, but provided a front seat view over Loch Katrine, which you can see in the photo above. 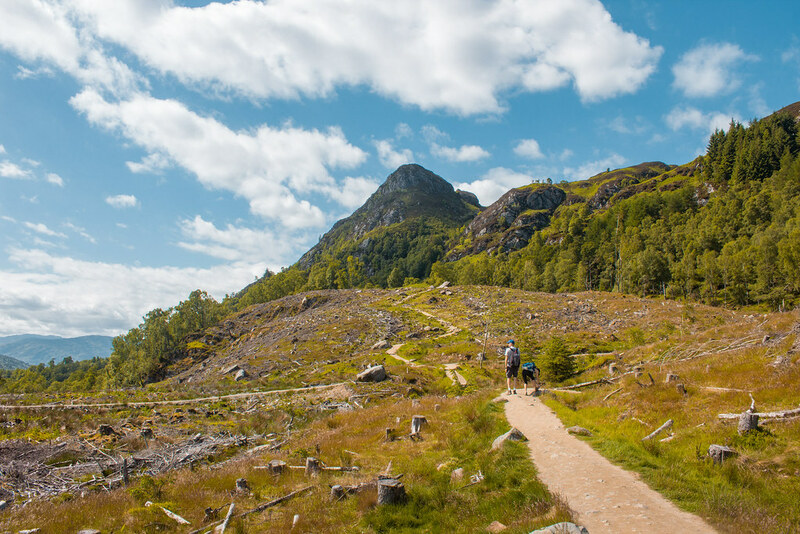 How long did it take to climb Ben A'an & how hard was it? It took us about 3 - 3.5 hours to get there and back, but we took it pretty easy (even though it didn't feel easy) and stopped often. You could definitely do it faster if you were fitter. Once we got to the top, it didn't feel like it had been that hard at all - or, rather, it felt like it was 100% worth it. It is steep and your legs might feel it for a couple of days after; but what's that for the memory of doing it? Wear layers & sunscreen; there isn't much shade on the trail at all, so if it's hot you'll probably want to be wearing something thin, but it might be chilly when you reach the top. Also, long sleeves are great at protecting yourself from the sun, too. 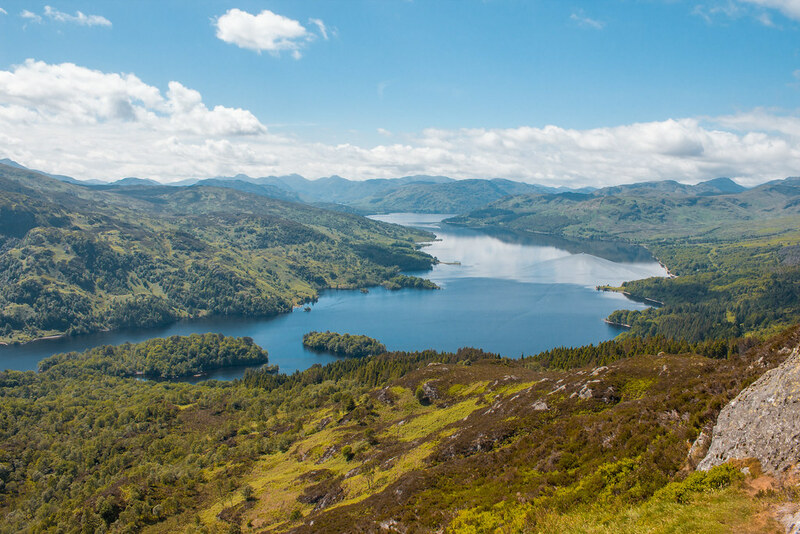 If you have time, I highly recommend visiting Loch Katrine, too - that car park is pretty expensive, so take more change. 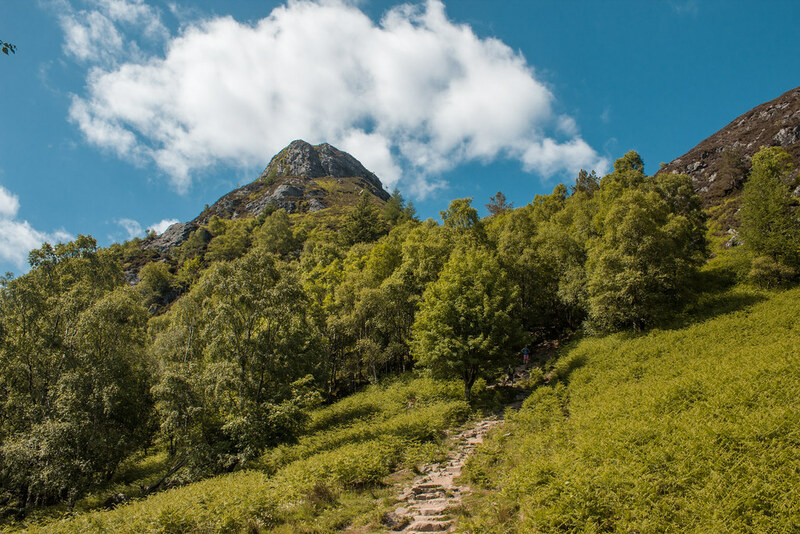 With an ascent of 340 metres, Ben A'an is a good hike if you're looking to explore the Trossachs and are a novice looking for a challenging hike. If you want more information, I highly recommend the Walk Highlands website because it contains all the info you need and you can read reports from people who've done the high. Use your common sense though, and walk to your ability and know when to stop and turn back if you need to.